This article has been updated with a clarification and correction at the bottom. In early 2006, Phil and Laurie Peace bought a little more than seven acres of land in Taylor Mill. The South Covington couple thought that one day they would build a home for themselves there. Then the City put a moratorium on construction as the Commonwealth of Kentucky began working on the ambitious widening of Taylor Mill Road (Kentucky 16). With their plans for a new home lost, Phil Peace got involved in land use study and explored possible commercial options for his Taylor Mill property. Finally, opportunity knocked when United Dairy Farmers, the large local chain of gas stations known for its ice cream, started to explore the possibility of developing the site. Just as the Peaces spent years looking for something to do with their land, UDF has spent a decade looking for a way into Taylor Mill. The Peaces said they informed City Administrator Jill Bailey that UDF would be submitting a detailed design plan soon. Two days later, the Peaces said, they learned that the City of Taylor Mill would be updating its 2007 zoning code in a manner that would prohibit the addition of any new gas stations in the area where the Peaces own land. "I don't have an answer to the sudden change," Phil Peace said Wednesday night. "We spent our entire life savings on this. We live paycheck to paycheck. Our family's idea of vacation is a weekend trip to Kentucky Dam Village and you may ask, why? Because for six and a half years we relied on the knowledge that our zoning was in placce. We knew the permitted uses and we were willing to sacrifice the short term for the long term." "We put our faith in the City of Taylor Mill that it would partner with us to bring something special to the people of Taylor Mill." Why the move to change the zoning was the subject of many comments at Wednesday's inordinately long city commission meeting. Three hours worth of comments from city officials, residents, and lawyers involved hints of conspiracy, incompatible visions for the future of the city, and wonky zoning code lingo. While the Peaces found themselves in the crosshairs of the city's plans to create a new Downtown, known as The Districts, rank-and-file residents of the city spoke overwhelmingly in favor of allowing a UDF to go forward and to compete with the city's sole gas station, a BP. "We are adjacent to a major interstate and will have increased traffic as more people come to The Districts," said attorney and resident Sharif Abdrabbo. "I wa sscratching my head. It did not make sense to me that we would not allow any other gas stations in the area. Add that to my desire to have choices in the market place, it was even more bewildering to me. As a citizen and a taxpayer, as a property owner, it's not clear to me if the decision to eliminate that one single item out of a (zoning) list of fifty permissible uses was fully debated by our elected officials." Resident Sarah Frietch complained that ample notice was not given to the citizens after the city decided in mid-December to seek a change to the zoning code eliminating gas stations as well as mandating that all new construction be at least two stories. The matter was heard on January 2, a few weeks later, at the Northern Kentucky Area Planning Commission (NKAPC) which sided with most of the residents' position. Other residents piled on. "I have a lot of love for this city and I really believe in its growth and I really want to see it developed," said David Quandt. "But some things have started to concern me and that is the lack of transparency developing between the residents and the leadership." Resident Michael Scott Smith said that plans to create a walkable community around what will eventually be a five-lane highway would be difficult. He also expressed concern over the two-story building requirement and also over the fact that one owner has possession of a great deal of land in the area being developed, including possession of the sole gas station. Attorney Martin Butler represents the Peaces. He called the January 2 meeting of the NKAPC hearing "convenient" since it was snowy and the day after a holiday, implying that decision to change the zoning was being rushed without proper community feedback. "What I heard at that planning commission public meeting on that very bitter, cold, snow-laden night is that (residents) want choice, alternatives, competition - say it again - competition, including but not limited to price competitiveness," Butler said. "They want choices as residents and as consumers and easily accessed services." "This is a loud and clear message. I hope you heard it." The property purchased by the Peaces sits at the corner of Honey Drive & Pride Parkway in what has been designated as Downtown Taylor Mill 2 for zoning purposes. There are four Downtown zones as part of the efforts to create a Downtown where previously existed only a strip mall, a gas station, and a few fast food restaurants. The portion of The Districts currently under construction is thanks in no small part to The Holland Rosen Development Group, which will move its headquarters there and relocate one each of its many Skyline Chili and LaRosa's locations. It also recently added First Watch restaurants to its portfolio. It also wants nothing to do with a UDF in Taylor Mill. Gary Holland was not present Wednesday but had a letter read by Jill Bailey. In the letter, Holland wrote that multi-story storefronts should become a model for the region and that this is an opportunity to set Taylor Mill apart from other shopping centers. "Good things come to those who plan accordingly," Holland wrote. "Seize this opportunity to prosper and set yourself apart from every commercial development in Northern Kentucky." Holland's compant has invested roughly $10 million into its Taylor Mill efforts. Tim Kling, a real estate director for UDF, said that his company is also ready to invest in Taylor Mill, but would need to operate as a gas station and would not fit the two-story requirement. "We have been successful in opening (180) stores by working closely with communities such as yours," Kling said. "Our interest is in bringing a new store to the Taylor Mill market. We have invested significant time and effort over the years investigating opportunities to locate a store that would properly serve this market." "We were obviously concerned to learn of a change to the zoning code," Kling continued. Mayor Dan Bell told the Peaces that the zoning change was not personal. He said that the land they own is not large enough to fit a UDF gas station with a minimum of six pumps and to accommodate the trucks that would frequent it. The mayor also said that the City will explore the option of a two-story facade requirement as opposed to a full two-story building. The Peaces found sympathy from City Commissioner Debby Kreimborg. "When I walked in here and saw how important it was to everyone, I say my thought is we do nothing in regards to zone two as long as you go with the building guidelines. That's what I think," she said. "One thing with being on council, you want people to love the city. I want people to be happy here and if that's what everybody wants, I'm OK with that." Commissioner Dan Murray said he supported the Peaces all along. "I've been the lone voice up here," Murray said. "Competition drives America." Commissioner Roger Reis supports moving forward with the zoning change in order to maintain the original vision for The Districts. "Looking back on the vision when we first started talking about that, I thought we wanted to keep it unique," Reis said. "We don't want it to be another Dixie Highway, a (US) 18, a (US) 42." Commissioner Ed Kuehne urged the Peaces and their possible partners at UDF to submit a plan. "Everything now is on Facebook. Let's get a plan defined," Kuehne said, pointing out that a great deal of debate about this issue had transpired online rather than in reality. Attorney Butler said that it was still, even after three hours of the meeting, unclear as to why gas stations would be removed from all of the zones, not just on the property owned by the Peaces. "When it comes down to it, it's a vision you try to have," Mayor Bell said. "We're trying to create something for Taylor Mill." Correction & Clarification: The original version of this article indicated that there were no final decisions made at the meeting. That is not the case. No action was taken to prevent gas stations from operating in Taylor Mill's Downtown Zone 2 meaning that the UDF proposal can move into the next phase of submitting plans. Votes were taken to instruct City Attorney Frank Wisch to draft ordinances pertaining to barring gas stations from operating on the site of the Holland Group's development, requiring 2-story structures there, and reducing the parking space requirement. 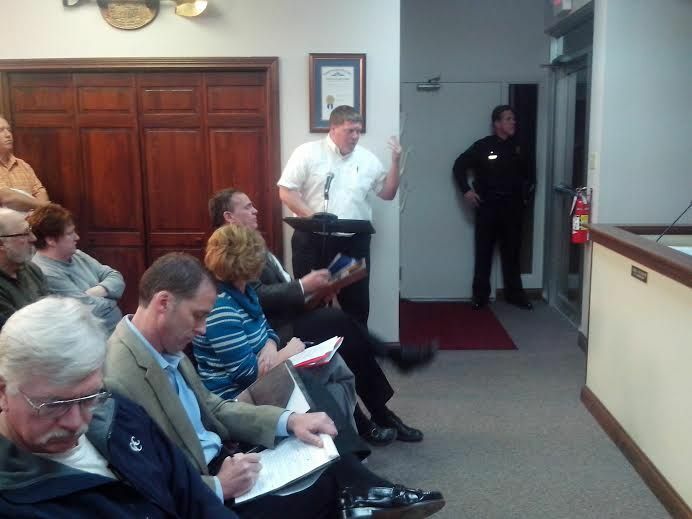 The issue of 2-story requirements elsewhere in Downtown Taylor Mill was tabled for a later meeting. The River City News apologizes for this inadvertant misrepresentation of events.